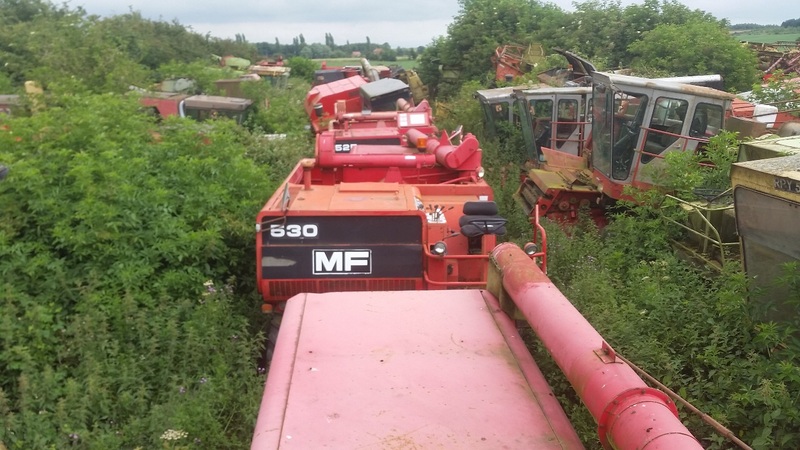 In a quiet corner of a farm in North Lincolnshire UK lies a graveyard dedicated to one particular brand of Combine Harvesters! 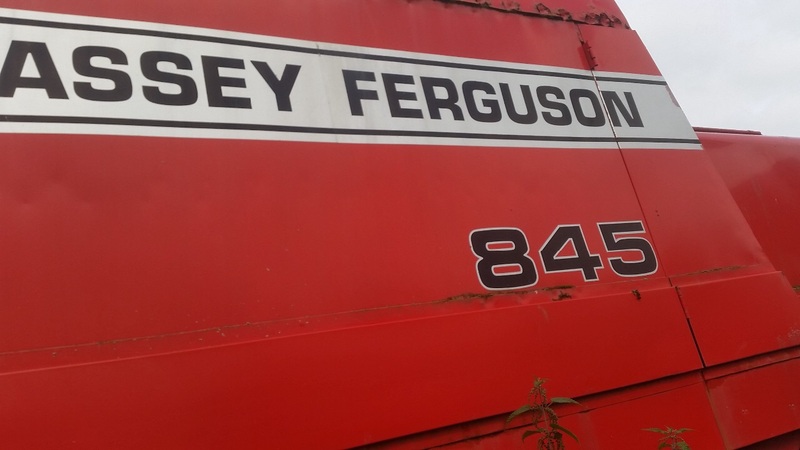 Massey Ferguson. 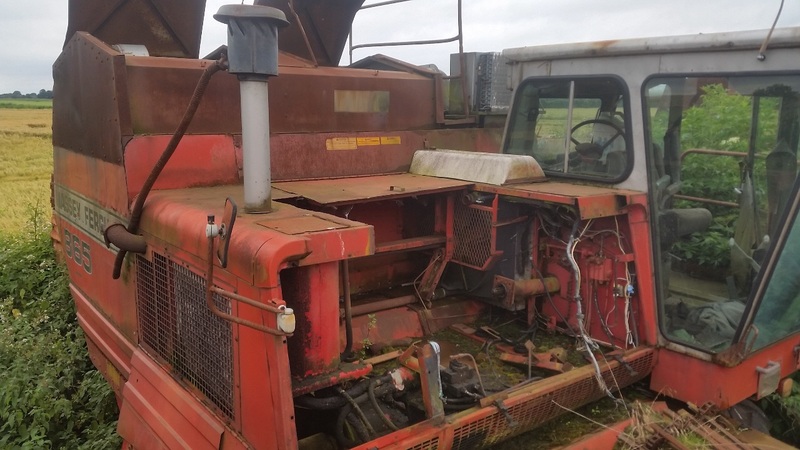 The following photos have been sent to me by New Zealand Custom Cutter Cameron Mckay, Cameron has featured several times on yellowswirl and he is a correspondent for yellowswirl seeking out any information regarding Massey combines still at work in that country. 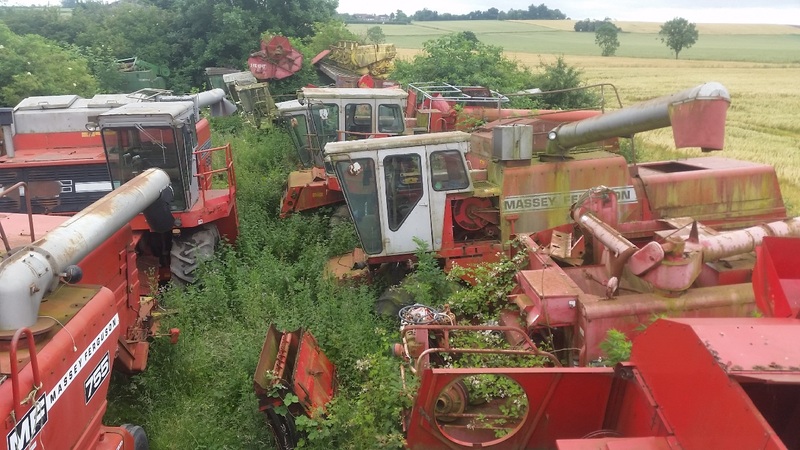 While taking a break before his harvesting starting in Cambridgeshire Cameron took a trip out to visit this yard and photograph the current machines there. For owner operators like ourselves these type of private collections are very handy to fall back on to supplement spares that are no longer available. 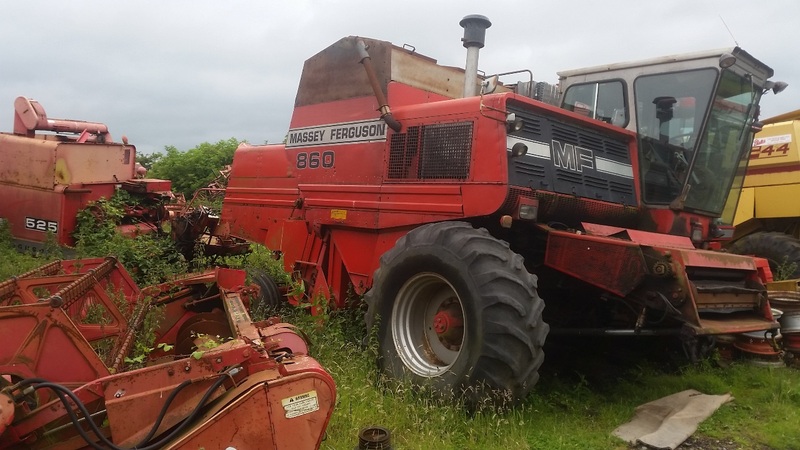 It is somewhat sad to see these once proud giants of the wheat fields languishing away, but everything in life has an end and particularly with Massey Ferguson the spares situation with the Kilmarnock and Brantford Canada models dried up many years ago. As the years roll buy these models will be confined to collectors as ourselves or museum collections. And this probably isn't many years away now. 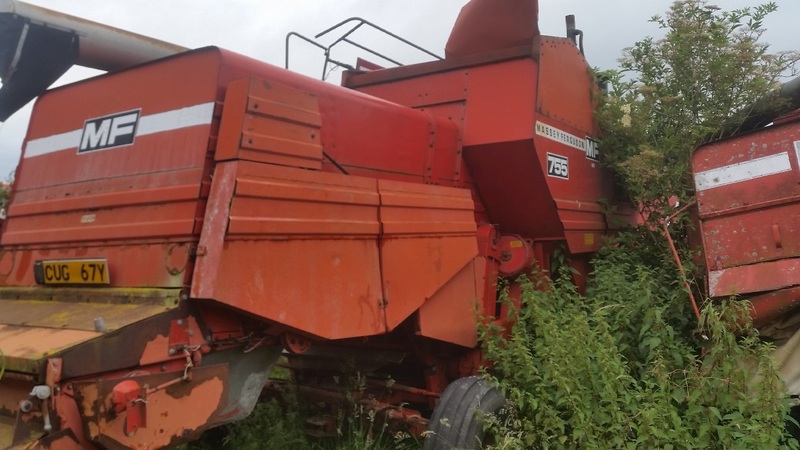 For sure many past owners have gave up on even good working order combines because of the risk of breakdown and time taken to seek out a second-hand part, and with the usual unpredictable weather patterns time really is precious for a large arable grower. But for those of us with smaller acreage it still represents a cost effective way to carry out the job. 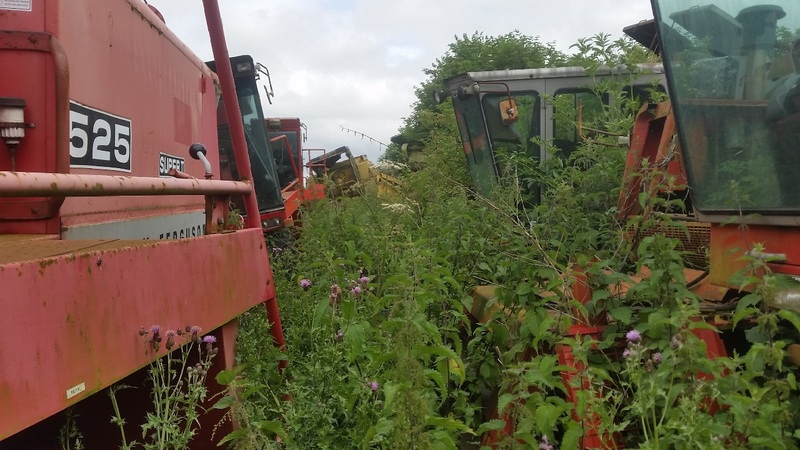 With combines approaching 30/40 yrs old the slightest even less serious problem has resulted in them ending up in a yard as this. 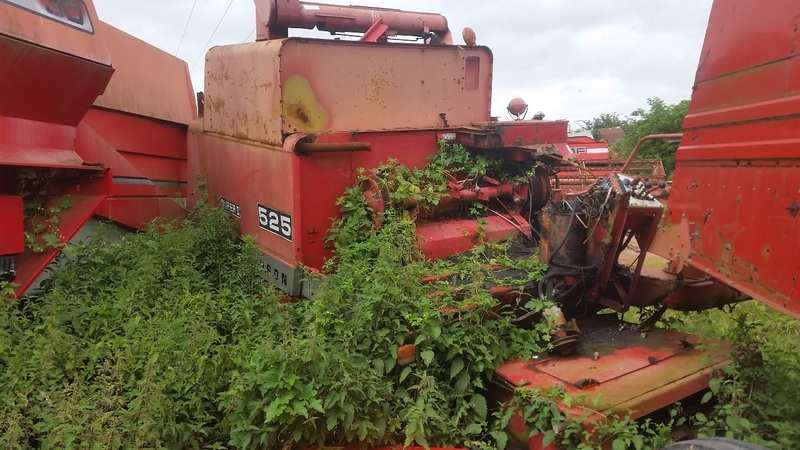 One of the biggest killers of combines is indeed fire and this has ended many machines working career. Whether the current flagships of today will still be working into their 3rd or 4th decade is probably unlikely due to the speed of the technologies that run the combines and its trend to consistently update systems and render older models financially not worth rebuilding, also the colossal amount of input and acreage that they are expected to harvest each season will mean the wear rate on all components will be much more excessive than anything built 25 yrs ago was expected to cut in their working life. 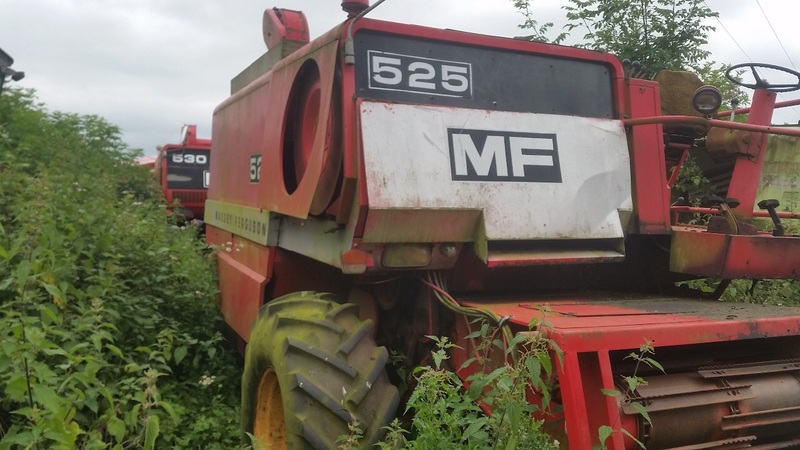 The very popular 525 model, this fairly complete machine one of many thousands of models built at Kilmarnock sits and awaits her fate, The French built predecessor 530 directly sat behind. undercover during its working life. A few Brantford built 750 and 800 series that have been picked of spares, lurking in the bushes. The bright silver paintwork in contrast to the dull faded red and mother natures relentless green carpet encompassing these past giants. 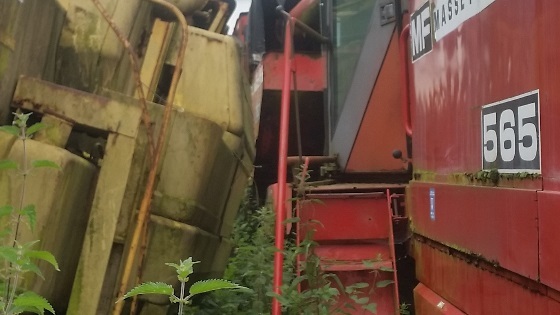 A rare piece of yellow can be found in the shape of a New Holland Table (header) at the rear of this picture. 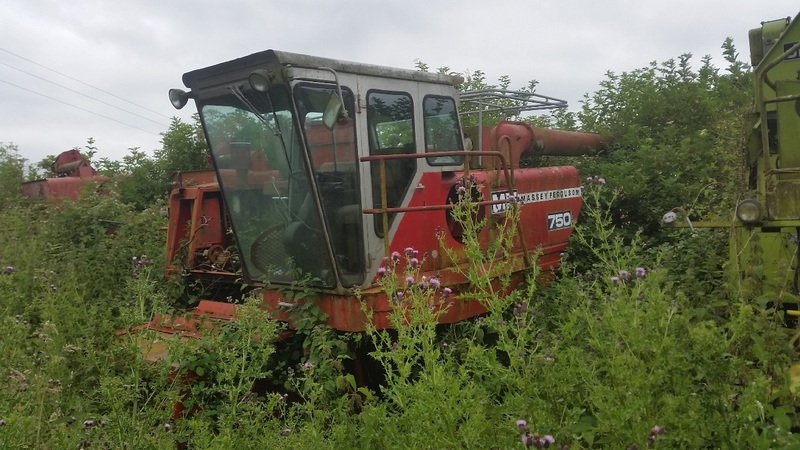 This 1982 registered 755 looks like she's been here a while judging by the faded paintwork, her straw chopper still attached waiting for another crop to chop that will never come now. 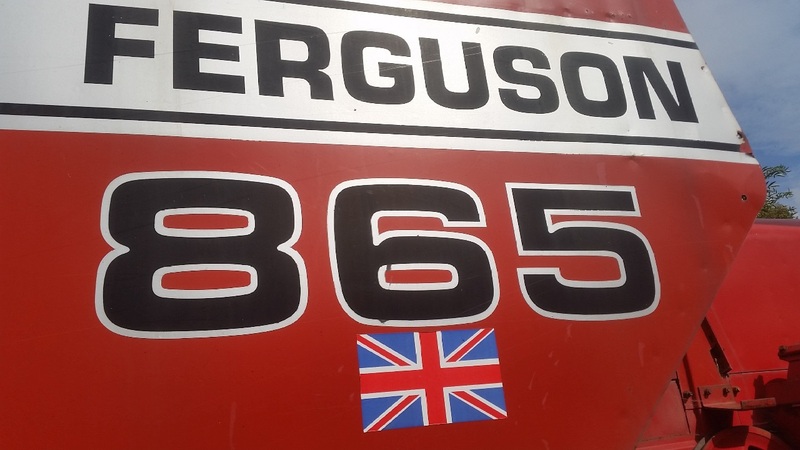 The Union Jack emblem proudly displayed on this 865. At the mercy of Mother Nature now, from her home in Brantford Canada to a quiet peaceful spot in rural England its journey now at an end. 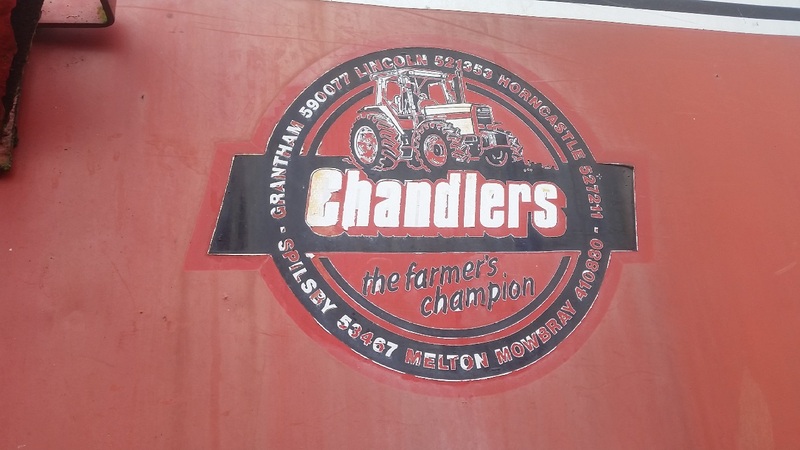 A well known Massey dealers badge who sold many Massey badged models even up to this day! Another well known name from the past ! 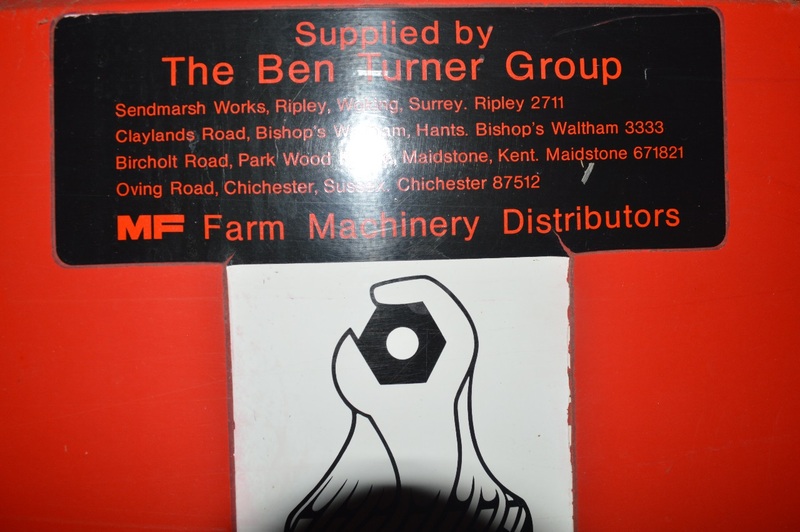 The Ben Turner group , who sold a lot of Massey Combines. Another 525, note the grain tank extension kit and the tank feed cross auger raised to accommodate extra capacity. 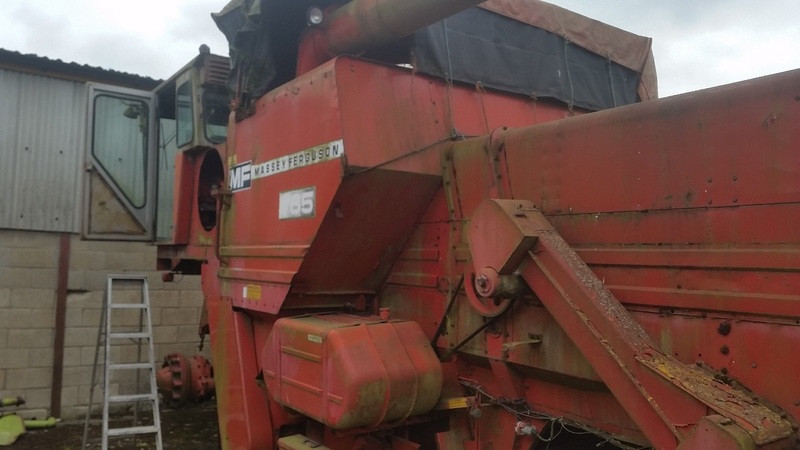 This machine has had several parts stripped notably the A6 engine this would no doubt come out straight away very popular engine and being on a combine it would be unlikely to of accumulated more than a couple of thousand hours. Note the hydraulic pump still attached to the pipework a usefull spare to have in your parts box! 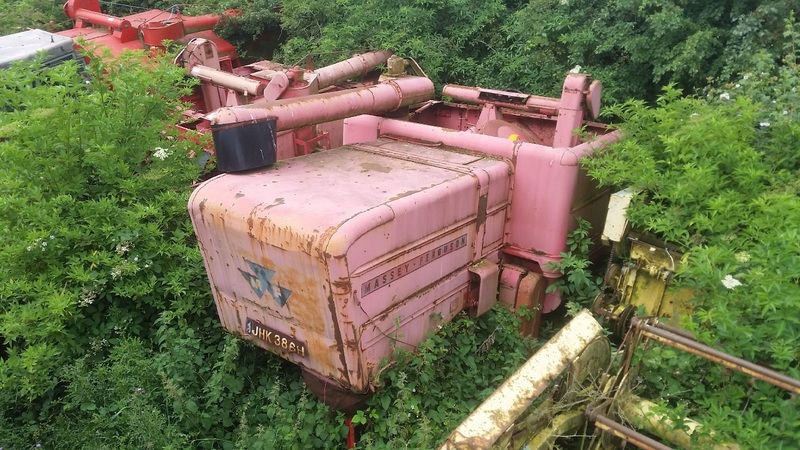 A not so common sight now in any combine breakers this 1970/71 possibly a 510 it's pink paintwork a result of fading and the primer coat colour used! . Another 525 but this picture shows the operators platform and interestingly the hand rail has the later type extension added which means it was a late model build at Kilmarnock, this was brought in to satisfy Health and Safety regulations at that time? Obviously they didn't consider the dust as a problem! Interestingly these handrails had caused a few accidents while folding the steps in the end bar near the gear selector was found to push the selector in gear under certain circumstances! Causing a few accidents, until engineers rectified the bar angle. This Marquette built 565 was the later model which followed on fromo the 525 625 that ended with the closure of the Kilmarnock factory. Sitting alongside a New Holland. Looking up an avenue of Canadian built models, with a Kilmarnock built model second right squeezed in between. This 865 looks like a recent arrival! And looks fairly complete. Mother natures relentless cycle gradually consumes these onece proud frontline machines. 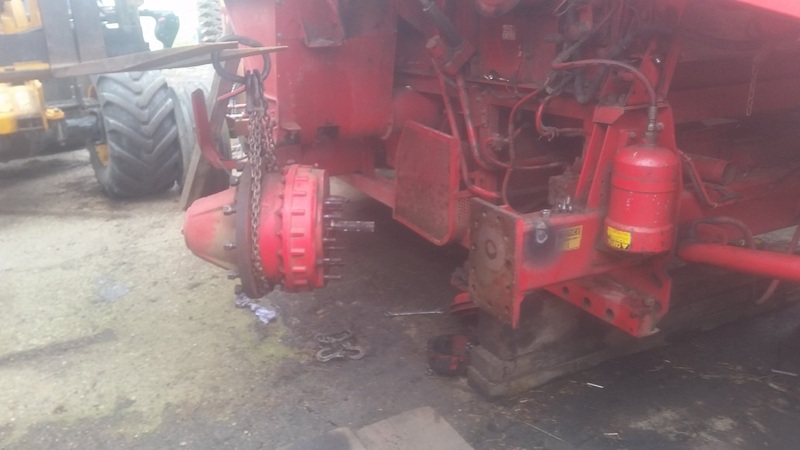 Precious spare parts being stripped from this 865 to keep other combines in action! Parts can end up anywhere in the World! An earlier 755 model with the earlier fabric tank covers, in the process of being stripped. Without doubt owning and operating these veterans would be pretty much impossible without the very few breakers scattered across the UK,and as time moves on it will get increasingly harder as the models gradually meet their inevitable end of their working lives. 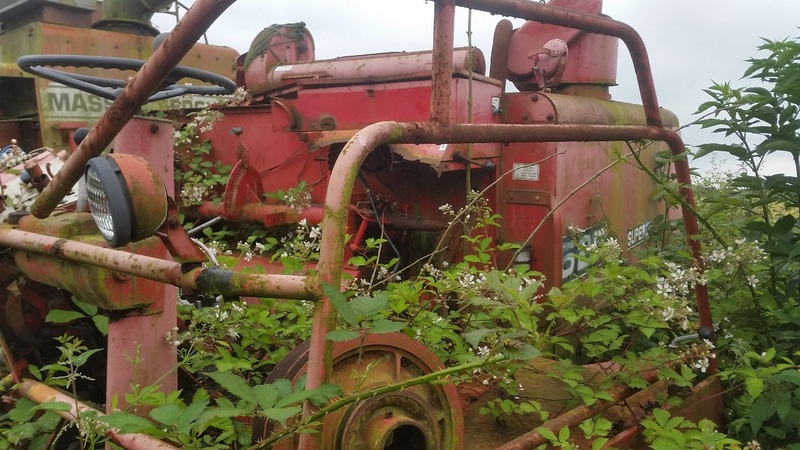 Also when the price of scrap metal is strong owners of these yards are tempted to reduce the amount of machines rather than wait long term for a gradual demise of customers who faced with older wore out combines opt for newer models. So for the time being there are spares available but this luxury is very shortly about to get very difficult indeed. My grateful thanks once again To Cameron who sent me these photos and the owner of the combines for letting me list them on Yellowswirl. 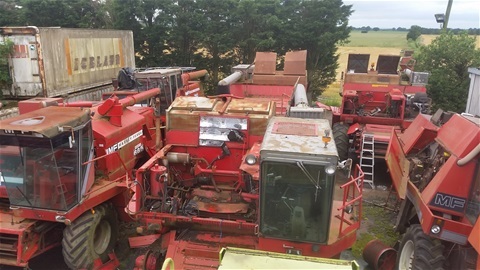 We will catch up again in the new year with Cameron and his harvest in New Zealand and his growing fleet of combines!